THIS PRODUCT IS NO LONGER AVAILABLE. We now offer an equivalent product here. 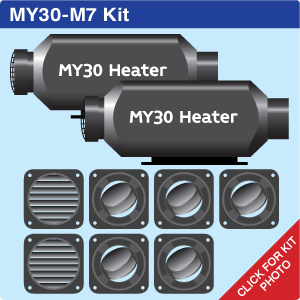 For boats over 42ft it is recommended to use two MY30 heaters, these would normally be set up so that one heats the aft and part saloon and the second one heats the forward area and part saloon. This type of installation tends to work better than using one large air heater. The Mikuni MY30 is a proven performer for its reliability and quiet operation. 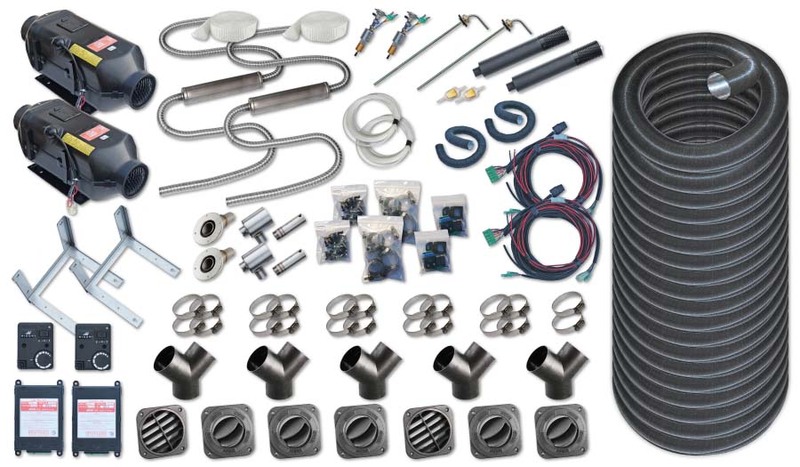 The two compact diesel heaters in this kit both have a powerful 3.5kw output and a 1.7kw half-setting for comfort and economy. Each heater is operated by an individual solid state thermostat control. This system can be upgraded with the addition of a programmable timer. Exhaust terminals are available as a flush fitting stainless steel skin fitting or hard wearing brass hull fitting. Fuel lines are available in plastic for offshore craft or copper for inland craft. Select the voltage suitable for your electrical system.